This cabin bed has been designed to fit into an alcove within the child’s bedroom. 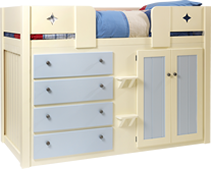 The cabin bed has been painted in bone white with the doors being royal blue. The bed has also been finished off with brushed chrome handles to give it a modern look. With space limited, we have also created a side door to give access behind the shelves for additional storage. Have an enquiry about this product?